MICHAEL Hutchinson remembers a weekend in 1980 as a turning point in his life. Apart from meeting his wife Sue and the birth of their daughters Kate and Sophie, there are not too many times that have had such lasting impact. “I’m very thankful to my sister (Maree) for inviting me to come to that celebration,” Michael said as he thinks back to that Easter in Brisbane when he was a university student in his twenties. He had tossed in his clerical job with the government to chase his dreams. “There was an urge … that I needed to be doing something a little bit more challenging, a little bit more about helping people,” he said. He had an idea of heading into some kind of rehabilitation work. “But life takes some interesting twists,” Michael said, referring to that invitation from his older sister Maree, who is a Sister of Mercy. She had been involved with a group called Faith and Light, which had been co-founded by Canadian Catholic Jean Vanier as a network of communities for people with intellectual disability, their family and friends. Members of the group in Brisbane were gathering at Easter 1980, and Michael’s sister asked him to join them. “I went along … and I thought this is pretty interesting, and I got pretty immersed into Faith and Light and Jean Vanier philosophy,” he said. Michael’s been so influenced by Jean Vanier ever since that he has gone on to become Brisbane’s community leader of L’Arche, another international movement founded by Vanier to “create communities where people with and without an intellectual disability live relationships of mutuality and trust”. L’Arche (French for “the Ark”) is an ecumenical Christian organisation providing supported accommodation in a community environment. L’Arche says “central to the life of the community is the belief in the unique value and gift of each person with a disability, and in the spirituality within each one of us”. Michael’s recharged with the L’Arche spirit, having recently returned from the Federation Assembly in Belfast with 600 other L’Arche members from around the world. Even during Michael’s 21 years working with disability service provider Endeavour Foundation and before joining L’Arche, he always had the Vanier philosophy in the back of his mind because of his Faith and Light experience and after having done a retreat with Vanier. “I was fortunate enough to do a retreat with him about 1984 down in Hobart, and I’d met him in ’81 in Lourdes, when we went to a Faith and Light pilgrimage there,” he said. And a book Vanier wrote in 1979 – Community and Growth – is a “good ‘bible’” for Michael in his work and ministry. “I think there’s probably a couple of rewrites since, but I’ve still got the old version that I got in 1981 in the Catholic shop in Goulburn for $2.95,” he said. “It’s starting to get a bit dog-eared now, but it’s a great book. 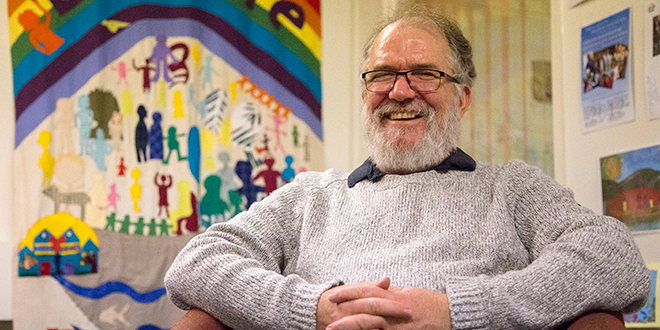 What Michael holds most dear about the Vanier way is the priority the theologian and philosopher gives to building relationship with members of his communities. “That sat very well with me,” he said. He said the heart of the philosophy was “the giftedness of the person with disability, and they’re different gifts, maybe, to what society would necessarily see that you need to have, or goals, or whatever it is that society would deem to be important”. “There’s a simplicity about (Jean Vanier) and just a genuiness – and authentic – just his love of people, his belief that people with intellectual disability have gifts and they do make a difference in the world, and it may be a very counter-cultural world view,” he said. Michael talks about the transformation that comes from being in community with people with disability. For him, that can be about the need to “slow down”. “I’ve been involved with people with intellectual disability for a long time, probably in a more formal way, since 1981, and I guess, sometimes you’ve got to slow yourself down, and they can really teach you that,” he said. “And then, well, do we? “And we just need to walk that road together. “I guess to still want to do what I’m doing each day, and do it with love and joy is transforming in itself, and why do I do that? That’s at the heart of being leader of a Brisbane community with two houses for six people with intellectual disability –four in one and two in the other – and with assistants who live alongside the members with disability, a wider group of supporters, a board of members looking after the governance of the association and a council of elders. The live-in assistants include L’Arche members from other parts of the world. The strength of the relationships in community was evident recently when Michael had a bout of illness. “Because I’ve been unwell, (one of the people in one of the L’Arche community houses) who I take on holidays every year, and he rings me generally every day – he rang and asked ‘Are you okay?’, and he was really deeply concerned. He was in tears actually,” he said. “He said, ‘I’m worried’ (because Michael was having a medical procedure the following day). “He said, ‘I’ll pray for you’. It spoke to Michael “about that whole notion that rather than meeting somebody, doing something unto them and then going away, and going home – these guys, we’re enmeshed”. “I think it’s about being with, rather than doing for. That’s really strong in L’Arche,” he said. And what’s that about for Michael? “I guess, my own faith,” he said.